The Kazakh, a Turkic people, constitute foreign born (1st generation) people from the country of Kazakhstan. Historically, they are known for being pastoral nomads, dwelling year-round in portable, dome-shaped tents (called gers, or yurts) constructed of wooden frames covered with felt. They migrated seasonally to find pasturage for their livestock, including horses, sheep, goats, cattle, and a few camels. Their diet consisted largely of milk products supplemented by mutton. As industrialization and modernization took place, many Kazakh abandoned their former lifestyle for a more modern lifestyle. Many Kazakh in the United States reside in apartments, their own homes and work near Americans in everyday business lifestyles. The majority of Kazakh adhere to Sunni Islam. However, some are also atheists. Pray God will reveal the truth in God not only being the ultimate Creator God but also an intimate one revealed through Jesus Christ. Pray Christians will pay attention to their surroundings, recognizing that Kazakh might reside in their neighborhood. 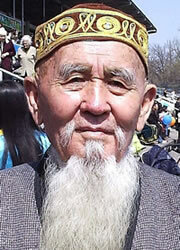 Pray Christians will become friends with and minister to the physical and spiritual needs of the Kazakh.